Until recently, Snapchat was perceived by many as a passing fad. The popular social media app allows it’s users to interact with each other through disappearing images and videos. However over the past year more and more signs show that the app needs to be taken seriously by businesses. With over 8 billion views per day and more daily active users than Twitter (150 million!) Snapchat marketing is the next big trend within digital marketing. In a report carried out by ComScore, it was reported that Snapchat is second only to Facebook in time spent on social media platforms per month. 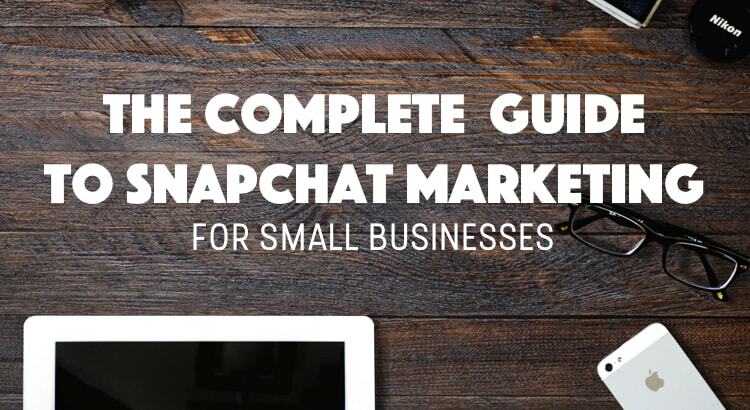 If you don’t have a Snapchat marketing strategy yet, it is about time you started to plan one. By reading this guide you will learn exactly when you should be using Snapchat, how to grow your views per snap and how to engage your viewers. Why does Snapchat marketing matter? First, let’s talk about why you need to be marketing your brand on Snapchat if you aren’t already. 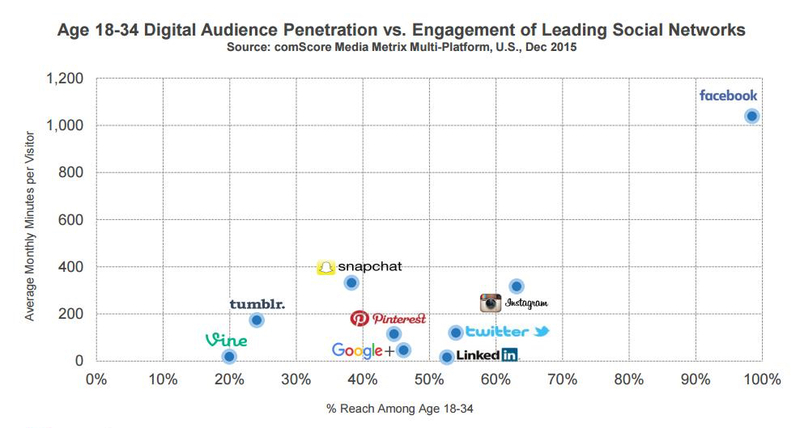 Snapchat has an incredibly high rate of engagement amongst it’s users compared to other mediums. When businesses attempt to promote a product, launch or grand opening they often turn to their email list. If you have worked hard on your mailing list to keep your subscribers engaged and responsive, you will be lucky to achieve 25% open rate at best. As Gary Vaynerchuk commented here, if you have 1,000 followers on Snapchat it is more than likely that 900 of them will watch your story. That’s an amazing 90% open rate! It is the way that users interact with content on Snapchat that makes it unique and different to other platforms. Just because your pre-roll ad got 1,000 hits, it doesn’t mean that 1,000 people looked at it or engaged with it. The majority probably checked their phones or scrolled on other tabs while it played. With Snapchat, users manually select which stories they view and it is the only piece of content on their screen at that moment. This means that they are a lot more likely to listen to the message and hear what you have to say. So not only is it the amount of time that is being spent on Snapchat you can use to your advantage, it’s the way in which it’s users interact with content. If you are targeting millennials that this article probably contains the most important information you will read this year. You NEED to be on Snapchat in 2016 and 2017. Marketers have often found the millennial generation difficult to target and Snapchat marketing appears to be the perfect solution to this problem. In addition to this, the average amount of time spent in-app daily per user is 30 minutes. Millenials are spending a huge amount of time each day on the platform and if you want their attention being active on Snapchat can extremely effective. We will discuss the best ways to find and engage with them later on. Hopefully you are convinced by now that you should be using Snapchat marketing as part of your growth strategy, but you may still be wondering when you should be using the app and what to create your content around. Next I will discuss the best situations and occasions to take advantage of Snapchat in. Give your viewers direct access to behind the scenes action at your live events. You may be attending trade shows, charity events, grand openings etc. which are all great opportunities to show your audience more about your business. Be casual and fun. One of the most unique aspects of Snapchat is the captions and drawing tool. Use these to make creative images and videos to show your personality and company culture. This is a good opportunity to differentiate your business from your competitors. The NBA were early to embrace Snapchat marketing and used it in the 2014 draft. They provided viewers with content that they wouldn’t have been able to see on other platforms and close ups of the action. Tip: Use geofilters to add an extra layer of personalisation and uniqueness to your events. Previewing products on Snapchat is a great way to generate some buzz around a launch or update. The short videos and disappearing element will get your viewers excited for the launch. Tip: Post the previews exclusively on Snapchat and tell your followers on other platforms to add you Snapchat to increase your views (more on this later). Although Snapchat videos are limited to 10 seconds each, you can create an entertaining story by stringing together multiple short videos. Keep your stories short, to the point and creative. Tip: Download a well made story and upload it to Instagram and Facebook etc. as an example of what your followers can expect over on Snapchat. So you may be thinking, that sounds great but who will watch my Snapchat marketing content? Next we will discuss some simple techniques that you can use to increase the size of your audience. One of the quickest ways to grow your audience is by using the following that you have already built. Post your unique Snapcode on your other social media profiles to give your followers an easy way to add you. Snapcodes work by allowing users to scan another users code and add them automatically. You can find your Snapcode by tapping the ghost icon at the top of your camera screen. Your Snapcode is yellow surrounded by randomly placed black dots that make it unique to you. This is what you will use to post on your existing platforms. Your followers will be able to add you quickly by simply scanning your code. Tip: Customize your Snapcode by using the Snapcode Selfie feature. Try adding some humour to your code to encourage people to add you. Hosting a competition is an effective way to build on leveraging your existing following by adding a further incentive for people to add you. There are many different types of competitions that you could run so get creative! It is best to keep the entry requirements quick and easy. Often this could be simply adding your username on Snapchat in order to be entered into the prize draw. Tip: Make it as easy as possible for people to add you on Snapchat by putting your profile images on social media as your Snapcode during the competition. Ghost codes is an app that is designed to help Snapchat users find the best people to follow. It can be difficult to discover new contacts on Snapchat and Ghost Codes does a great job of changing this. This also means that you can make it easier for people to discover you by using the app. Simply create a profile, upload your Snapcode and a few details about what type of content you post. Ghost Codes users vote on who they like in various categories and those with the most likes are shown on the app. Becoming a top-voted user can increase the size of your audience dramatically. The better and more engaging the content that you post on Snapchat is, the more likely it is that you will reach the number one spot for your category. When you meet a customer in person ask them to add you. If you are at a trade show or special event you can offer a reward for this or enter new followers in a competition for example. Tip: Give your followers an incentive to add you on Snapchat. This could be a giveaway or a free sample of your product for example. Be prepared to make a loss in order to start growing your presence. Tip: Keep your username simple and easy to remember as when someone enters it into Snapchat they must type it correctly. Snapchat offers no suggestions to help users find the account they are looking for at the moment. If you can, it is best to avoid unnecessary numbers and characters. Once you have built your audience you need to give them a reason to check your stories regularly. As the platform is not saturated with brands yet, you will get ahead start by becoming an early adopter of Snapchat marketing. When you post to Facebook only 17%? of your followers on average will see your post. This percentage is significantly higher when you post on Snapchat. You should expect at least 90% of your Snapchat followers to view your stories. So by producing appealing content and engaging your audience at this early stage you can stand out from the crowd. You need to give people a reason to follow you and stay engaged with your content by checking it regularly. A great way to do this is by offering deals that are not available elsewhere. This will ensure that your followers watch your stories as they won’t want to miss out on a special offer. One study found that 58% of college students were most likely to purchase a brands products if they were sent a coupon on Snapchat, rather than an alternative social media network. Try this out and you may be surprised to see a better result than you normally do on Facebook and Twitter. Tip: As links on Snapchat are not clickable, you won’t be able to track your results through your usual analytics software. A way to get around this is by using a unique code for your offer. For example by using the code ‘Snap30’ you can track how many of your customers entered that code on your site and how many bought your offering. Giveaways are also great for keeping your following engaged. Invest in a prize that you target market would be excited about and keep the barrier to entry minimal. A great way to spice up your giveaway and make it unique is by using on-demand geofilters. They can include your logo, a message or anything you like. On-demand filters can generate thousands of impressions very easily as they are a fun way for your customers to show off their location. Make sure your design is fun to use so people will want to use it. It shouldn’t feel like a direct advert. Partnering with influencers is one of the best ways to improve your companies visibility and you should definitely consider it. Snapchat influencers are modern-day digital celebrities. They were usually early adopters and know exactly how the platform works and how their viewers respond to different types of content. Make sure you research different influencers to find the ones with matching demographics as the goal is to leverage their following. One of the most common forms of influencer marketing on Snapchat are account take overs. This is were a celebrity will be given access to a companies account for a period of time to create an entertaining story and interact with followers. Tip: If you are paying the influencer then make sure they post about the partnership on their social media channels to drive more followers to your Snapchat. Snapchat is a community and you should get your viewers involved by asking questions, getting feedback and interacting with them. Tip: When someone replies to you, record the response with another phone and post it to your story. This way your viewers can keep up to date with the discussion and participate too. So is Snapchat marketing something that you should be using the drive potential customers to your business or website? The answer is absolutely ‘yes.’ If Snapchat is not part of your marketing strategy yet, then you need to make a change. The sooner you start a Snapchat marketing campaign the better as the platform is still in it’s infancy and provides small businesses with incredible opportunities. Don’t miss out!